This professional football team is based in Atlanta, Georgia. The Atlanta Falcons form part of the NFL’s National Football Conference (NFC) South division. Their current home stadium is in the opulent Mercedes-Benz Stadium and the Falcons’ head coach is Dan Quinn. First established in 1965, the Atlanta Falcons joined the NFL as an expansion team in 1965. The NFL had offered then owner Rankin Smith the team to keep him from joining the NFL’s rival football league the American Football League (AFL). Smith paid $8.5 million for the Falcons, the highest price, at the time, anyone had paid for a franchise. The Atlanta Falcons wear read, black, white, and silver uniforms. Their mascot is Freddie Falcon who’s been around for more than 35 years. The Falcons have two main rivals: the New Orleans Saints and the Carolina Panthers. The New Orleans Saints have been their main rivals since their debut season in 1966. They’ve both shared a division and, over time, a heated rivalry has developed between the two Atlanta teams. Their rivalry with the Panthers is smaller. Both the Atlanta Falcons and the Carolina Panthers have shared the NFC West division since 1995 and the NFC South division since 2002. 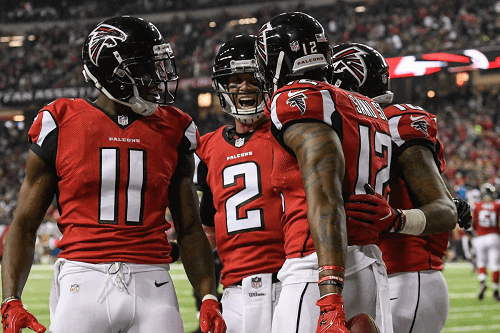 Overall, the Falcons have appeared 14 times in the NFL playoffs. In 2010 and 2017, they didn’t make it past the NFC Divisional playoffs. While in 2011, they didn’t make it past the Wild Card playoffs. However, in 2012, they made it to the NFC Championship but lost to the San Francisco 49ers. Finally, in 2016 they made it to the Super Bowl LI but lost to the New England Patriots. Their other Super Bowl appearance was in 1998. They unfortunately lost it to the Denver Broncos. The Atlanta Falcons have yet to lift the Super Bowl trophy. But fans of the team, and those looking to bet on them should bear in mind that their overall performance has been inconsistent.